A tale of mutiny, scandal, post-mortem celebrity and repeated body snatching in the 18th century. As far as the authorities were concerned, Richard Parker’s was a ‘good’ execution. The occasion and reports of his death had been successfully stage-managed to send their intended message: mutiny would not be tolerated. In early July, 1797 newspapers approvingly reported that Parker, a notorious mutineer leader, had been hanged and ‘launched into eternity’. The Admiralty hoped that Parker, and the naval mutiny which made him infamous, would soon be forgotten. To their horror, they had not yet heard the end of him; Parker would continue to haunt them from beyond the grave. 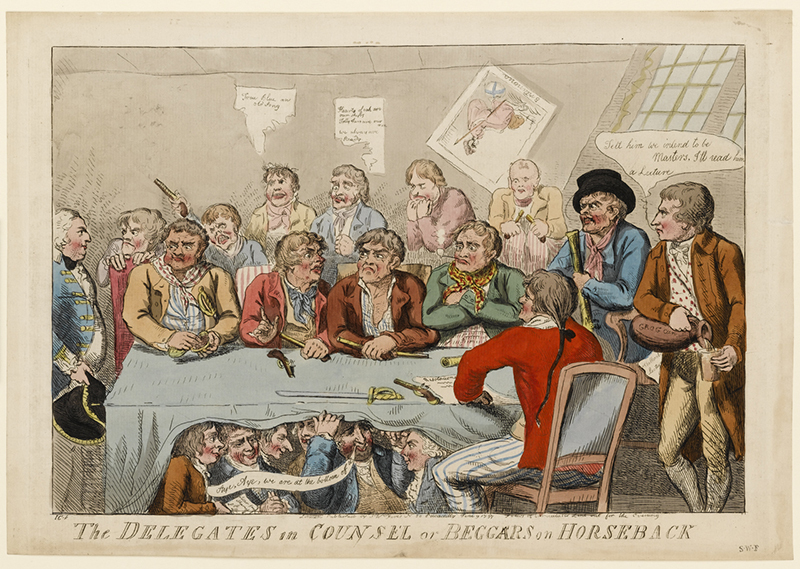 The mutinies which rocked the Royal Navy in spring, 1797 had terrified Britain. With French invasion feared at any moment, the British fleets responsible for home defence, over 30,000 men in scores of ships, refused orders to sail. Such behaviour by the navy – the nation’s beloved protector – occasioned feelings of shock and betrayal. Newspapers described ‘a calamity the more poignant as it is brought upon us by the Best Beloved Class of our Fellow Citizens’. Eight years before the apogee of its success at Trafalgar, Edmund Burke feared that ‘our Navy has already perished with its discipline forever’ and concluded that ‘our only hope is a submission to the enemy’. It was as the leader of one of these mutinies that Richard Parker earned notoriety. 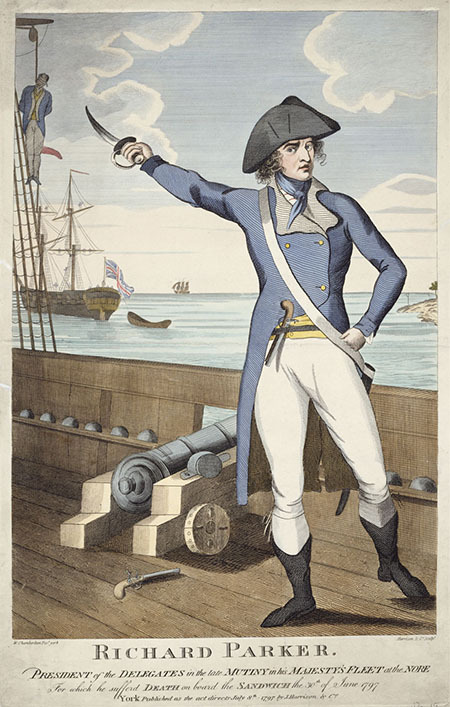 Described in the press as ‘Admiral’ and even ‘President’ of the mutineers, Parker soon became a household name. The objects, documents and images of the rebel leader Parker now held in the National Maritime Museum, Greenwich attest to the enormous public curiosity that surrounded this bogeyman figure. Following the eventual collapse of his mutiny, Parker was court martialled and sentenced to death. In order to deter further mutinies, the Admiralty planned to use Richard Parker’s execution to full effect and Parker proved willing to play along. He behaved in a ‘decent and sober’ manner, received religious instruction, publically recognised the justice of his sentence and prepared to meet his fate with solemn resignation. Finally, shaking hands with his captain, Parker called upon people to learn from his example and not to transgress as he had done. The overall effect was one of a penitent sinner. To face death with such calm dignity must have taken incredible courage. Determined that Parker should not become a martyr, the Admiralty hastily buried him in secret. They hoped that Parker would soon be forgotten or, if he should be remembered, that the lasting recollection would be of his contrite remorse. In this, however, they had not reckoned on Parker’s wife, Ann, whose courage was equal to, but very different from that of her husband. On hearing of her husband’s arrest, 27-year old Ann had raced south from Scotland to Sheerness. She arrived too late. Attempting to reach her husband’s ship for the third time, Ann was just in time to see a noose placed around Richard’s neck. Overcome by the shock, she fainted on the spot and was rowed back to shore. With the mutiny over, the nation breathed a sigh of relief. Few considered the grieving widow, but her determination would shock them all. Richard Parker’s final hours had conformed to the official ideal of the remorseful criminal, but, thanks to his wife, his unusually active afterlife utterly rejected and subverted this authorised narrative. Ann was single-minded in her resolve to bury her husband with dignity. Undeterred by either the official refusal to give her the body, or the ten-foot fence which surrounded the cemetery, she hatched an audacious plan. In dead of night, she and three other women managed to scale the gate, remove the soil ‘with their hands alone’, and haul the coffin over the gate. They then successfully concealed the coffin until passing cart drivers agreed to transport it covertly to Rochester and then to London. Ann hid the body of her husband at the Hoop and Horseshoe Inn in Whitechapel, but it quickly became a public sensation: a macabre tourist destination with crowds queuing round the block. The Admiralty had buried Parker in obscurity at Sheerness and were confident that he would soon be forgotten. Suddenly he appeared on their own doorstep in London, lifted from the grave and exciting the lower orders of society into a dangerous frenzy. Thanks to Ann, defeat had been snatched from the jaws of victory. Terrified of the ‘tumultuous assembly’, local officials stepped in. The body of Richard Parker was stolen for the second time – this time from his widow. Within hours Ann had tracked down her husband once again. A staged diversion allowed the body to be secretly buried at the church of St Mary Matfelon, Whitechapel. Ann successfully persuaded the rector to recite the funeral liturgy over the body, thereby achieving her goal of securing a respectable Christian burial for Richard. In a widely-published statement, she declared herself ‘perfectly satisfied with the mode of his internment’. Both Richard and Ann demonstrated incredible courage, but in opposite directions: Richard in conformity to officially sanctioned ideas of crime and punishment and Ann in defiance of them. The body of the ill-fated Richard Parker was caught up in a contest of memory. For the Admiralty, its use and disposal sent a political message with ramifications for naval discipline, but these intentions clashed with the personal and religious needs of Ann. For her, it was a struggle over the final fate of her beloved husband and his immortal soul. The result was a tragicomic farce of scandal, post-mortem celebrity and repeated body snatching, which enthralled London and completely defeated the authorities’ original intentions. Despite the scale and danger of the fleet mutinies of 1797, they have received very little historical attention. Histories of the Royal Navy have preferred to concentrate on swashbuckling naval officers and glorious fleet battles. We can learn as much about the history of this crucial institution by studying those episodes which contemporaries preferred to forget. The 1797 mutinies were events that rocked Britain and transformed the mortal remains of Richard Parker into unlikely holy relics, whose possession and meaning were contested. Callum Easton is a PhD student on a collaborative doctoral project between the University of Cambridge and the National Maritime Museum.